The Cyber-shot DSC-QX100 is the high-end version of Sony's newly released iPhone-compatible wireless camera accessories, packing in a Carl Zeiss lens at an attractive price point. Like the low-end QX10, it's a forward thinking device with a great deal of potential that remains held back by shaky software. 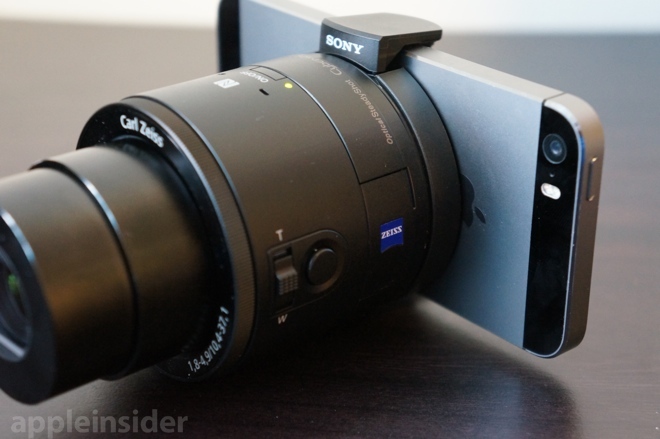 Sony's QX-series Cyber-shot cameras are Wi-Fi Direct devices that wirelessly connect to a smartphone, such as Apple's iPhone, which acts as the viewfinder. The lenses can be clipped onto the iPhone for a traditional shooting experience, or the lens can be controlled remotely from a short distance for more interesting shots. Each QX camera uses a MicroSD card to store shots remotely from the iPhone, though pictures can be transferred manually or automatically if a user chooses. 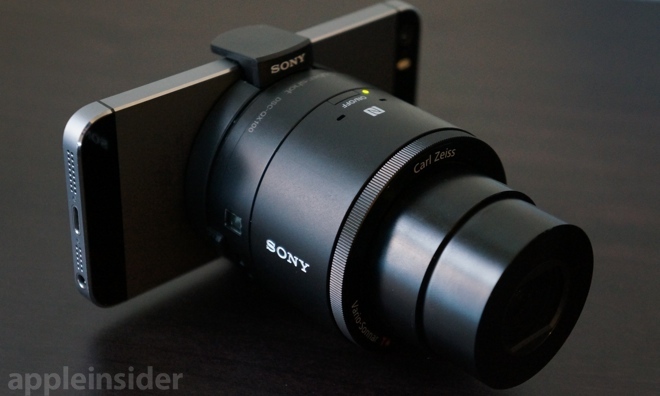 For the purposes of this review, Sony provided AppleInsider with a DSC-QX100 lens, as well as an 8-gigabyte Sony-branded MicroSD card and standard SD adapter. The QX100 features a 1-inch Exmor CMOS sensor capable of capturing 20.9-megapixel images with a Carl Zeiss lens. It's identical to the sensor found in the Cyber-shot RX100II camera, which retails for around $750, or about $250 more than the QX100's $500 price tag. It's also a big improvement over the 18-megapixel Exmor RCMOS 1/2.3-inch sensor and Sony G lens found in the QX10. But that improved image quality comes at a cost of size. 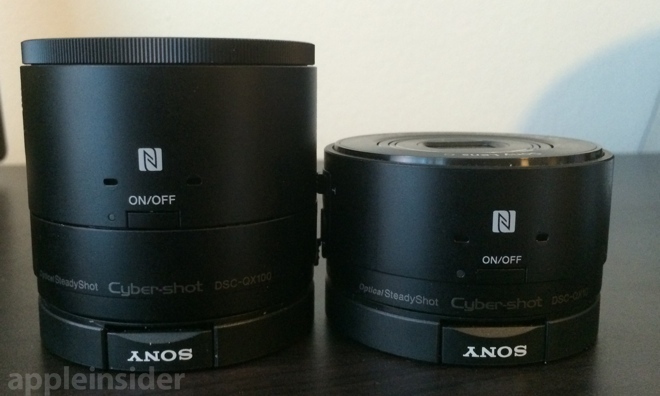 The QX100 is not quite twice as long as the more portable QX10. While we could squeeze the QX10 into a pocket if need be, the QX100 is big enough that it would definitely require a bag. The hardware of the QX100 has a few welcome changes. Most notably is a focus ring on the device for manual adjustments. 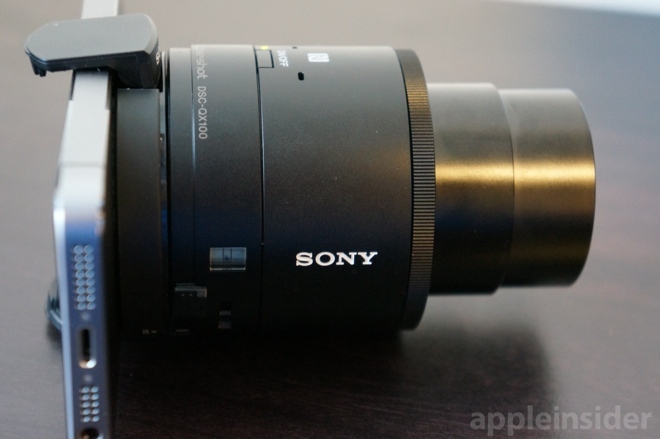 In addition, when autofocus is enabled through the Sony PlayMemories Mobile iPhone app that controls the lens, this manual ring reverts to a more precise zoom control. The QX100 also moves the MicroSD card slot to the side of the lens, making it easy to swap out a card without disassembling the device. This is an improvement from the QX10, which houses the MicroSD slot inside near the battery compartment, requiring some work on the part of the user to replace. Like the QX10, the QX100 also has a dedicated zoom control rocker on the left side of the device, as well as a hard shutter button. Both of these functions can also be controlled through the PlayMemories app. 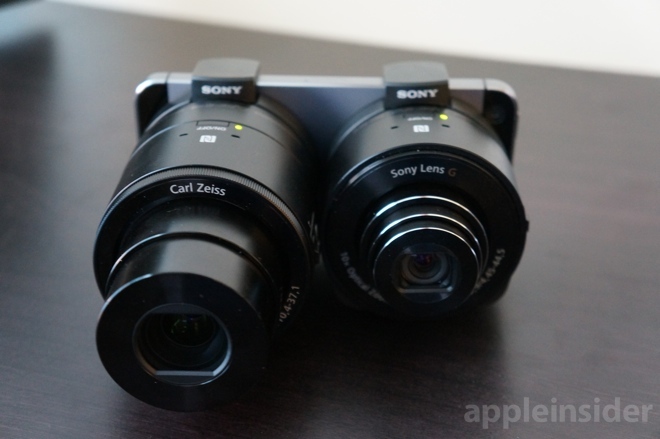 One area where the QX10 bests the higher-end QX100 is zoom: While the QX10 has a great 10x optical zoom, the QX100 offers a much shorter range with 3.6x zoom. While the optical zoom on the QX100 is considerably less than the QX10, it's also far more than the iPhone's built-in camera offers— zero. As we noted in our QX10 review in September, the Achilles' heel of Sony's QX-series cameras is the company's proprietary PlayMemories Mobile application for iOS, which offers substandard performance in controlling the lens. Sony explained that those issues were due to the fact that the software was not updated for iOS 7. Since then, the application has thankfully been upgraded with iOS 7 support and various bug fixes. The changes are in fact a marked improvement, but PlayMemories Mobile still has a long way to go, unfortunately. Before, it would take 10 or more seconds for the PlayMemories application to establish a connection with a QX camera and begin shooting. Now, that connection time is closer to 5 seconds. While this is a big improvement, we don't feel it's enough, though Sony may be hampered by the limitations of Wi-Fi Direct. Also improved are the amount of crashes and random disconnects we previously experienced with the PlayMemories app. The latest version provides a more reliable connection, though it's still not perfect. On a number of occasions we would be presented with a spinning wheel in the middle of the screen and were unable to snap a picture by using the app's shutter button. Using the shutter button on the QX100 still worked fine, but we were shooting blind without an idea if our subject was in focus, or in the picture at all. What makes the issues all the more frustrating is that when the PlayMemories app works, it works great. The live viewfinder is sharp enough to give an idea of what the captured picture will look like, and it's responsive with minimal lag. Sony has said that third-party applications like Camera360 and Camera+ will be adding support for controlling the QX lenses in the future. Those functions are not currently available in either app. 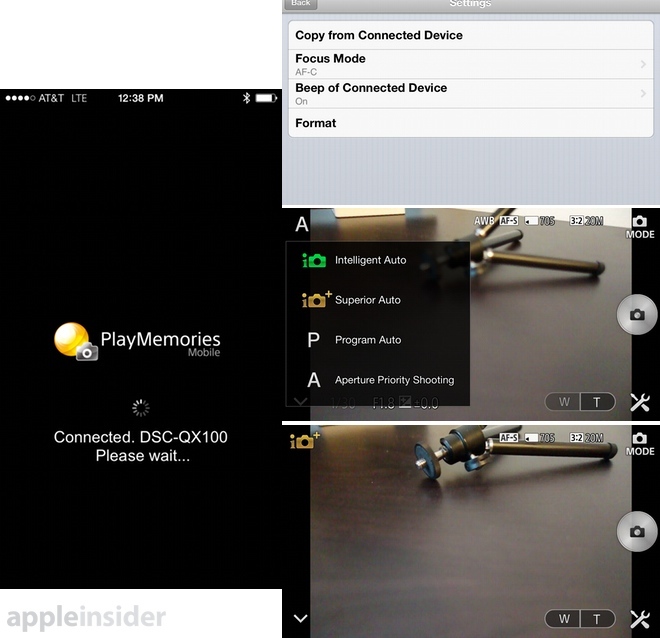 No updates to PlayMemories, or any third-party apps, are going to change the fact that connecting to the QX100 (and QX10) can be a hassle. If you're using your iPhone at home, where you presumably already have a Wi-Fi connection, you'll have to open the Settings app and manually choose to connect over Wi-Fi Direct to the lens. After that connection is established, you'll then have to launch the PlayMemories app to control it. If the best camera is the one that's available to you, then the setup process of the QX series pushes these lenses down the rankings. And those issues are further compounded by occasional hangups with the PlayMemories app itself. 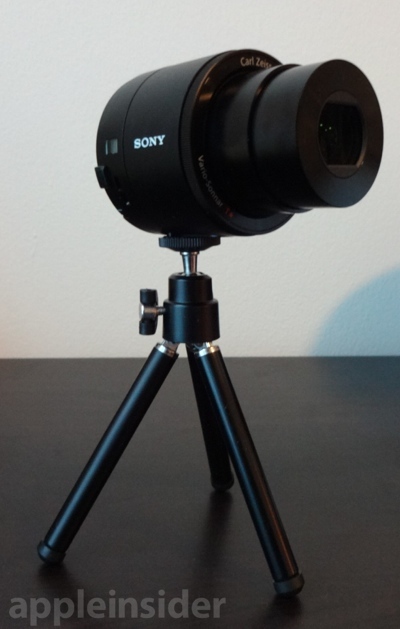 We commend Sony for improving its app, and accordingly adjusted our score on the QX10 camera from 2.5 stars to 3 stars. However, there's still a great deal of room for improvement, and we hope that further updates from Sony, or a potential third-party application to control the QX cameras, will further improve performance. New settings are also unlocked in the app when using the QX100, such as an Aperture Priority Shooting mode that give advanced photographers more functionality and flexibility.